Deliciously creamy Fuoco made with water-buffalo milk. Who says Canadian cheese cannot compete on the world stage? Jason Fuoco, a young Quebec cheesemaker who began producing cheese three years ago, was a major winner at the 2015 World Cheese Awards last weekend. 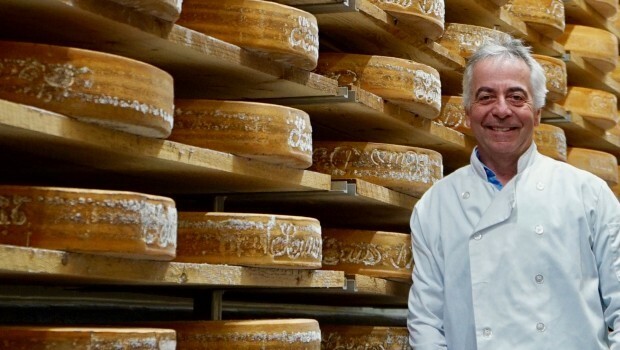 His eponymous Fuoco, a soft washed-rind cheese made with water-buffalo milk, was named Best Canadian Cheese and honoured as one of the top 15 cheeses in the world. Two Canadian producers, Fromagerie Fritz Kaiser in Québec and Quality Cheese in Ontario, each returned home with four medals apiece. Avonlea Clothbound Cheddar made on Prince Edward Island. Alfred le Fermier made by Fromagerie La Station. Nick Tsioros of Olympic Cheese, Toronto, was the sole Canadian judge on the jury. Le Gruyere AOP Premier Cru made by Switzerland’s Cremo and Von Muhlnen was named Best Cheese in the World. The biggest cheese competition in Canada, Canadian Cheese Awards/Le Concours des fromages fins canadiens returns in 2016 with the Awards Ceremony and Tasting Gala taking place in Montreal in mid-April.